Edgeworth's Balsam is an annual herb 25-60 cm tall, found growing on streamsides, rocks and grazing grounds in the Himalayas. It is particularly common in Kashmir. Flowers are born in racemes towards the end of branches. Stalk carrying the flower cluster is slender, 2.5-10.5 cm long. Flowers are yellow, streaked orange in the throat, 2.5-3.6 cm, carried on 1-1.3 cm long stalk. Upper petal is orange, rounded and crested. Lateral united petals are 1.8-2 cm long - upper ones are prolonged obliquely upwards, yellow-white. 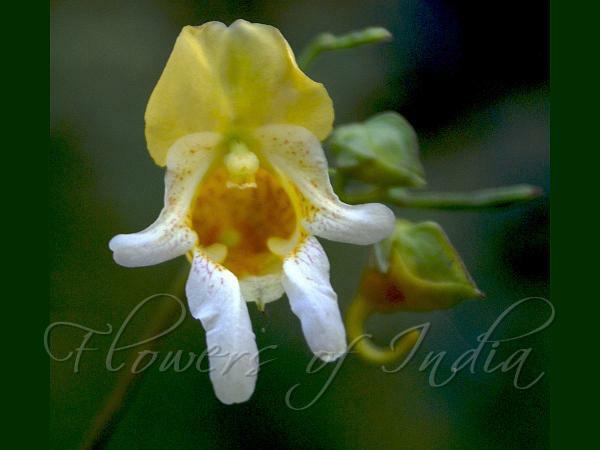 This feature easily distinguishes this flower from the similar looking Rugged Yellow Balsam. Lower sepal is narrow funnel-shaped, gradually narrowed to a slender curved spur. Lateral sepals are large rounded with crested midrib. Leaves are elliptic long-pointed, grouped in rosettes towards the ends of branches. 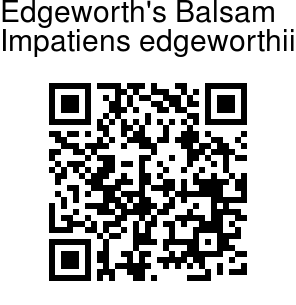 Edgeworth's Balsam is found at altitudes of 1500-2700 m. Flowering: June-September.